Vintage Barber Salon Mirrored Back Counter Bar Mid Century 1950s 2518-13. 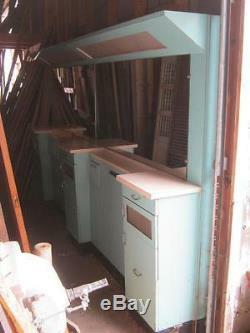 Nice robins egg blue with gold speckle Salon mirrored back bar/counter. Constructed of osb Board and laminate formica. Came from a 1950s barber shop in St. Has cool old 1950s chrome hardware. There are 2 work stations with set of drawers and cupboards on each side and one in the middle. The second door down in the storage areas has very nice ribbed glass, the door on the left side is missing glass. The bottom drawer in the storage areas is a tip out drawer and is tin lined. The second door down on the right side has broken hinge. There are scuff marks on the counter top in the center. The 2 piece mirror has a sliver out of the center on the bottom. The right bottom corner the mirror is also chipped. At the top there are 2 plastic covers a light fixture could be added here to make this back counter lighted. There are two electrical junction boxes on the front 1 for each work station. Overall it is in good condition. 132"wide X 80"tall X 18deep. The overhead lite are 51" X 7" each side. The mirror is 120" X 30". The item "Vintage Barber Salon Station Back Mirror Counter Bar Mid Century 1950s 2518-13" is in sale since Thursday, October 29, 2015. This item is in the category "Antiques\Mercantile, Trades & Factories\Barber Chairs". The seller is "nysalvage" and is located in Oneonta, New York. This item can't be shipped, the buyer must pick up the item.